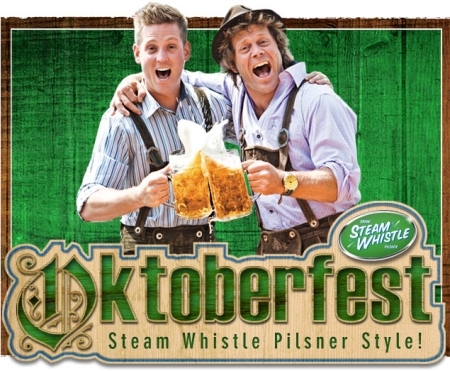 TORONTO, ON – As reported last month, Steam Whistle Brewery will be hosting an Oktoberfest party on Saturday, September 17th as part of Toronto Beer Week, and they’ve kindly offered a pair of VIP tickets to be given away to a lucky CBN reader. These “golden” tickets will give the winner and a guest line-bypass access to the event, as well as free Steam Whistle Oktoberfest t-shirts and a 1-litre stein to take home. Entry details appear below, but before entering, please note that the winner and guest must be 19 years of age or older, and the tickets must be picked up by the winner at the Steam Whistle brewery store between September 12th and 16th. If you’re not on Twitter, leave a comment on this post describing your favourite Oktoberfest tradition. Be sure to enter your correct email address in the appropriate field – it will not be displayed publicly, but will be needed to contact you in the event that you are the winner. The winner will be chosen at random from all entries submitted by 12:00 noon on Sunday, September 11th. Good luck! UPDATE: The winner has been chosen – congrats to Andy Hunter (@brassmoustachio), we hope you and your guest have a great time! The best part is the comraderie! Everyone drinks happily as a community, bursting out into song and cheers’ing with strangers. my favorite tradition at Oktoberfest is obviously beer drinking! I love the whole event, lots of beer, tasty food and entertainment. What could be better? I love how it brings out the best in people! An Otoberfest party is a fabulous tradition filled with happy people loving life and celebrating great beer. Add to this the roundhouse location and steam whistle beer… it’s an event I don’t want to miss! the food, the fun and the beer!